Are you looking for a last minute gift for a friend or family member, but don't know what to get them? We have many different gift ideas for the RVer you know, but one that will be great for any adult you are shopping for, is a unique Picnic Time Basket. Check out the many we have on our site including the popular wine and cheese basket. The wine and cheese basket is also known as The Vino, it does not come with bottles of wine or cheese, but it includes 2 handblown wine glasses (8 oz. ), 1 stainless steel waiter-style corkscrew, 1 hardwood cutting board (6 x 6"), 1 stainless steel cheese knife with wooden handle, and 2 napkins. 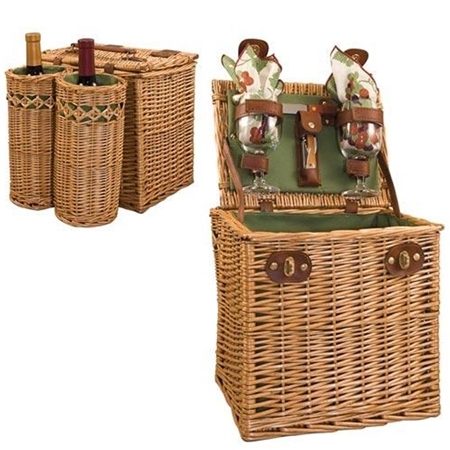 It is a beautifully woven basket that is perfect for any couple or wine enthusiast. The two pouches on the front for holding your wine bottles is insulated to keep the beverage cold and has plenty of extra storage to fit cheese and crackers or other foods. Also the basket has two locks on the front for a secure lid when closed and an easy to carry handle on the top. Like I mentioned before this is only one of many baskets. We have many others that have everything you need for a picnic including dishware, silverware, cups and much more. Find one that has enough settings for the entire family or just enough for you and one other person. Lastly choose the style, which can be anything from a woven basket, backpack, tote, and even one on wheels. Shop RVupgrades.com today to find all your last minute shopping gift ideas. Picnic Time is just one of the many ideas you can discover on our site. If you are the type of RVer that likes to explore the surroundings outside of the campgrounds, then you are going to need an easy way to take your personal vehicle with you on all your adventures. Not everyone wants to stay on site the entire time they are camping. So instead of having to site see and visit other places in your motor home, check out our many tow bars including the heavy duty Roadmaster BlackHawk 2 and other dinghy towing products you may need. One of our most heavy duty tow bars is the Roadmaster BlackHawk 2 All Terrain Tow Bar which is great for towing most vehicles, especially heavier/larger vehicles like suburbans, hummers and full size pick-ups. It has a large hook up radius allowing you to not be perfectly lined up and still easily connect. Just the same with disconnecting, the Freedom Latch makes it so you can release the tow bar at any angle. You will never have to worry about the lock binding or you skinning your knuckles ever again. 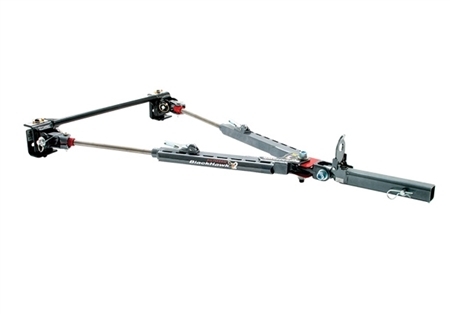 With this simple way of connecting and disconnecting it is possible for one person to hook up or unlatch this tow bar. It has built in channel guides, so you will never have to wrap up hanging safety cables and power cords again. This design was built to last with self lubricating nylon bushings to reduce friction, solid stainless steel inner arms and a powder coat finish for maximum durability and to keep it from rusting. This can be motorhome-mounted, conveniently storing it on the back. By using the storage latch you can fold it up and lock it into place, when ready to use again, lift the tow bar up and press the latch to release the lock. Towing a vehicle behind your motor home is a nice added feature, but always keep in mind safety. If you want the products that will make you feel safe when hooking up, check out dinghy towing products on our site at RVupgrades.com. If you have any questions please feel free to contact us.